The Boys’ Club was set up in 1947 by Mr. F. C. Paver of New Road and a group of enthusiastic residents. The Second World War had ended in 1945 but boys aged 18 were still expecting conscription into the armed forces under the title of National Service. 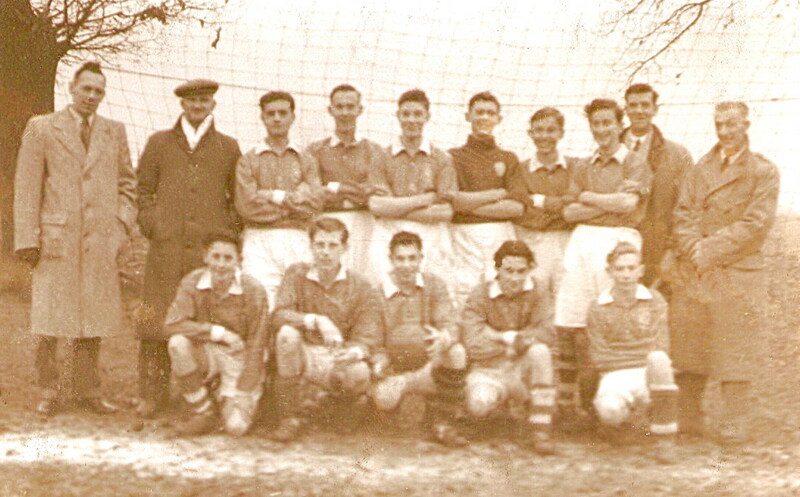 The club was formed initially to provide organised, competitive football for boys between school-leaving age and 18 years. 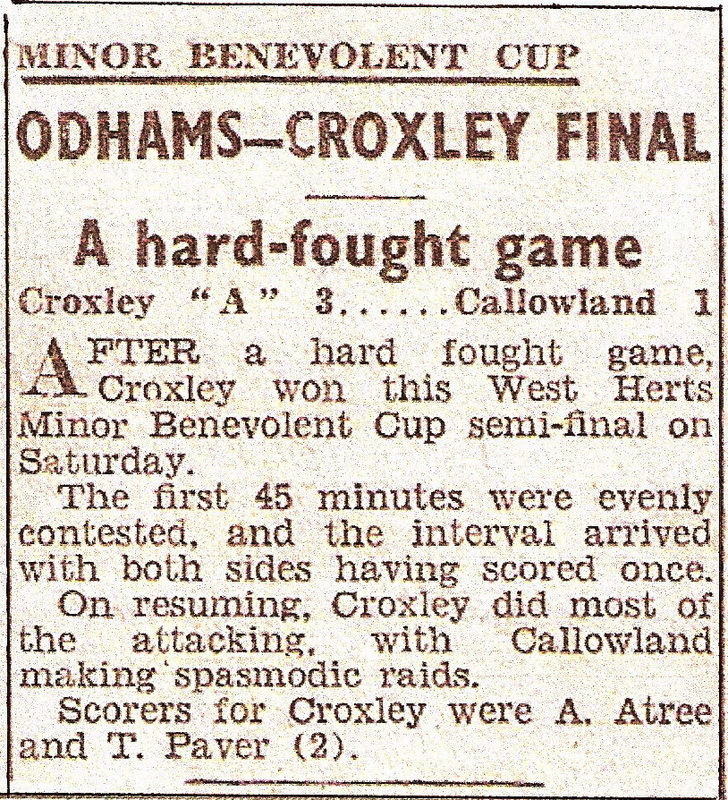 The name chosen was the Croxley Wanderers Football Club meeting in St Oswald's Church Hall. To give greater opportunities for the boys to mix, it was decided to form a properly constituted Boys' Club. 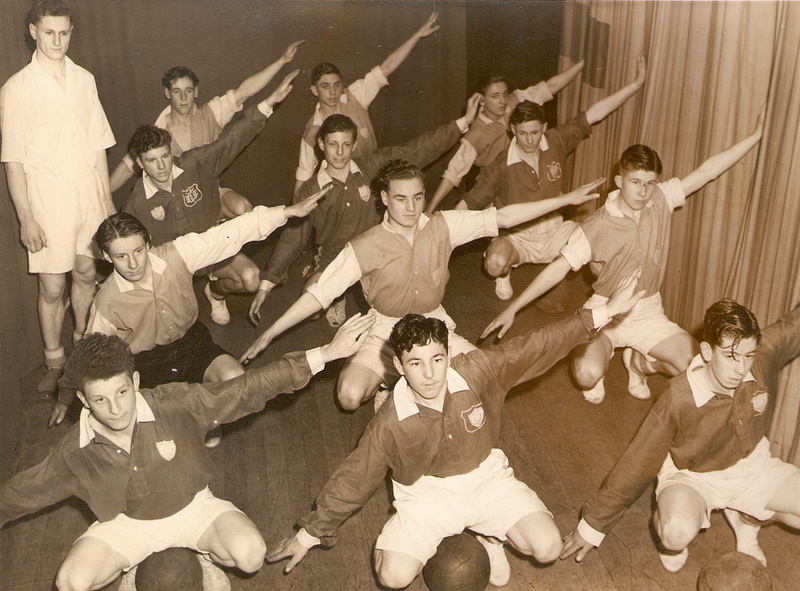 Hertfordshire Education Authority gave permission to use Durrants school hall as a club room, and equipment for indoor games was, with some assistance, provided by the club. An approach was made to join the National Association of Boys' Clubs and this was approved in a letter dated 4th January 1950. Affiliation to this organisation enabled the club to take part in a wider range of activities. 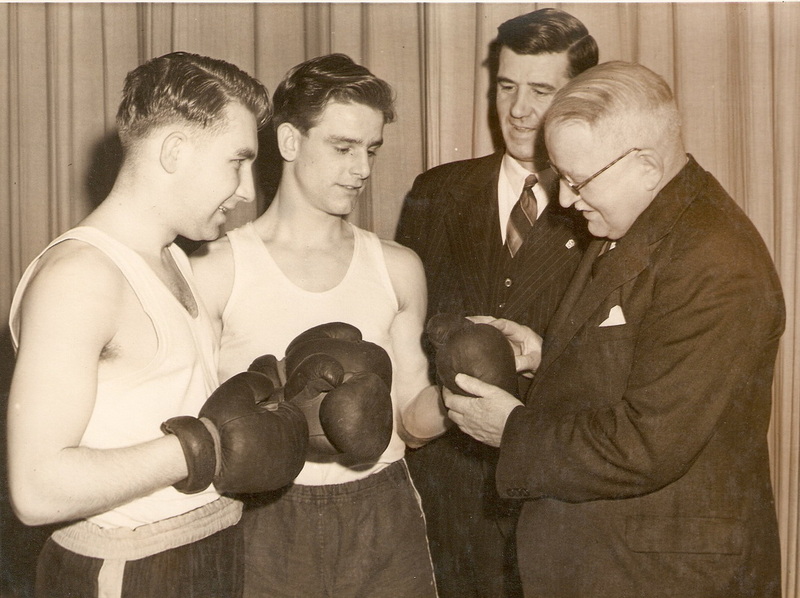 Boxing, table tennis, darts, cricket and a choir were among the choices the boys could become involved with before they were required to do their National Service. 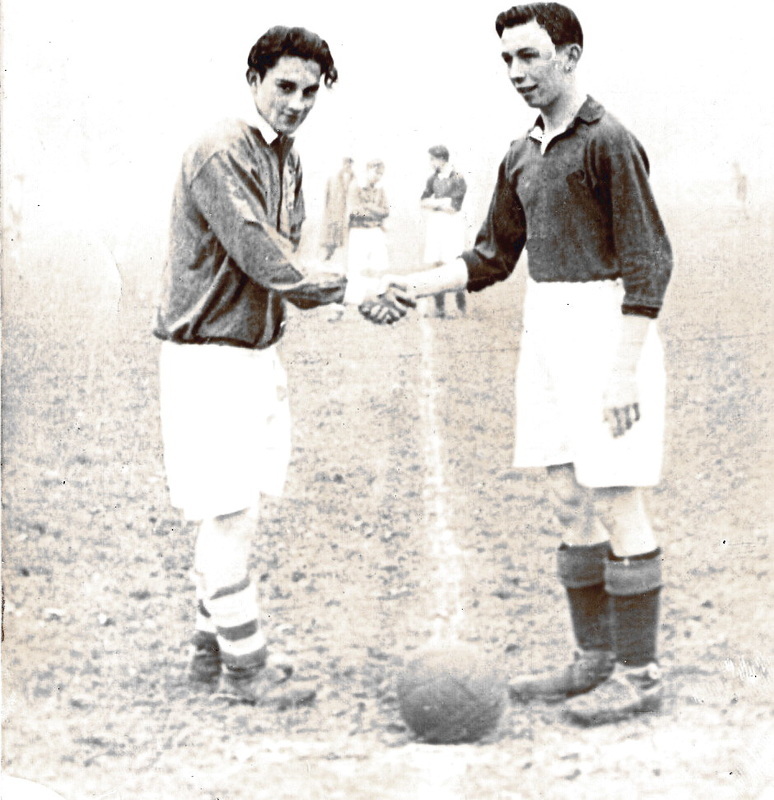 The following extracts are taken from two books recording the early history of the club. The text appears in the same order as it was written up. One book contains hand written minutes recording the meetings the club held. A second book consists of photographs and memorabilia connected with these early years. The two books were donated by John Drury, living in Swanage, Dorset, but formerly a resident of Croxley Green. Photographs were also donated by D Ballard of St Albans also a former resident of Croxley Green. (Apologies for any names misspelt as it was hand written. President: R.S. Wilkinson / Vice Presidents: A.E. Jeffrey (Headmaster Durrants School) / Sir Frederick Heaton / Mr. G Wilkins. Committee - Styles / Roberts / Hamblin / Smirke / Paver, Collins / J Pettit / Chamberlain / Walton. Minutes of the Meeting held in St Oswald's Church Hall 20th June 1947. 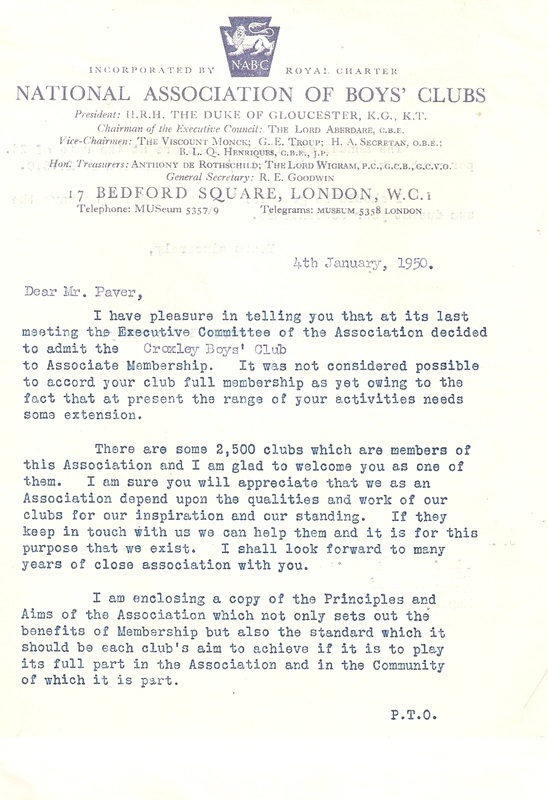 Correspondence from Mr. J Bray of Watford F.C. was read. This was regarding having a professional footballer to act as coach/instructor. Result of which will be given at next meeting. 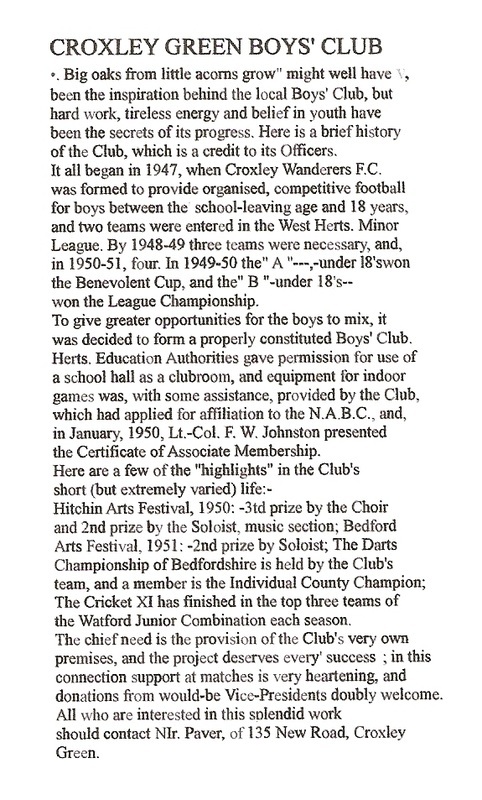 A letter was also read from Mr. A E Aldridge regarding our application to the Herts Minor League which was accepted. It was proposed that the 1st practice match should be held at Durrants School on Tuesday the 24th June at 7.15 pm. This was done not only for the opportunity of picking two teams for next season, but to keep the players together during a period when it was thought that other teams might try to induce them to sign for them. It was also felt among the committee the need to have two players from each team to represent their team mates at all committee meetings in order to voice any grievance or suggestions that might arise from the players. Subsequently C Adams & J Pettit should represent the under 18s. C Adams was proposed by Mr. McBride, seconded by J Francis. J Pettit was proposed by R Tizzard, seconded J Taylor. All were in favour, there were no other nominations. Also that W Pettit and Walton should represent the under 16's. W Pettit was proposed by Messrs. Reading and seconded by Walton. Walton was proposed by D Bowyers, seconded by K Bowden. All were in favour, There were no other nominations. A committee meeting was fixed for the following Wednesday 25th July at 7.30 St Oswald's Hall. An appeal was also made for any parents that might be interested to come along and help: with regards to this, the response was very poor. A few minor details regarding the new boundaries were discussed and accepted also the wish from Mr. Jeffrey that that the Club should refrain as far as possible from playing boys that were playing regularly for their school. The Secretary expressed regret that so far Blaw Knox hadn't written regarding what was happening to all their football gear, but hoped to do so in the near future. A Christmas draw (raffle) was started in 1947 with members selling raffle tickets at 6d each (approx 3p in current decimal coinage). A total of £30 16s 0d was collected = 1232 tickets sold. Meeting held St Oswald's Hall June 12th 1947. 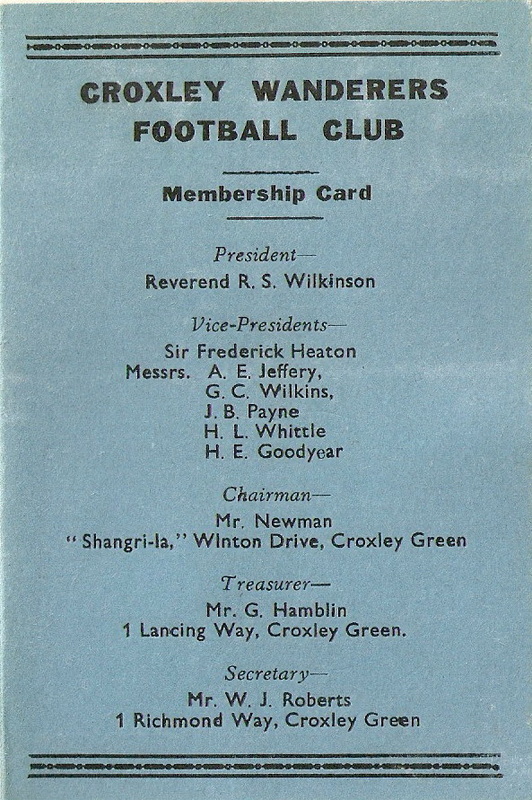 It was proposed and seconded that as time was limited to the commencement of the Football season 1947/48 that the Rev'd R S Wilkinson be elected President, Messrs. F Heaton, A E Jeffrey, G C Wilkins, Vice Presidents, Mr. G Styles Chairman, Mr. G Hamblin Treasurer, Mr. F Paver Team Manager 16's Mr. G Smyrke Team Manager 18's, Mr. W Roberts Secretary. All Offices to be held for one year and to be voted for Annually. All the people mentioned had given their assurance of assistance which the Club was still in its infancy, hence the reason why there is no mention of election in the minutes of the meeting held on the 20th June. This motion was duly voted for and carried. Although bad luck was experienced in both competitions both teams finished runners up in their respective sections both teams being one point behind the League Champions. 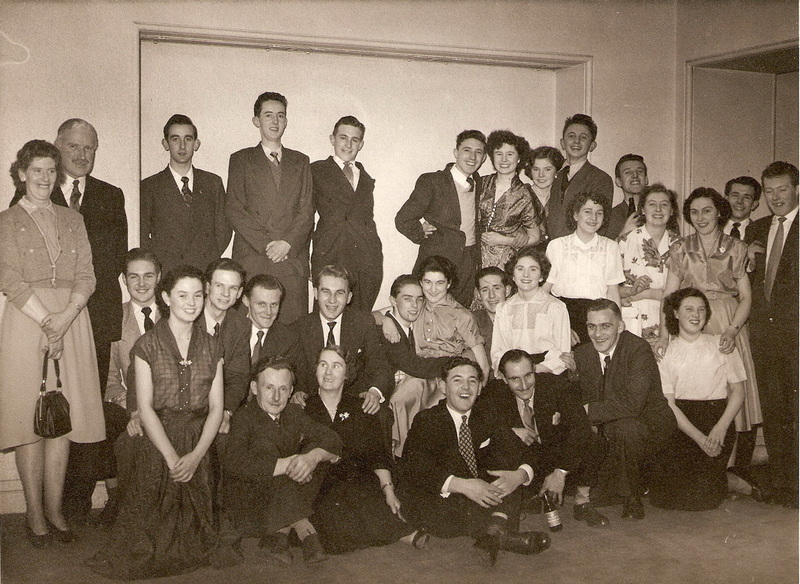 A social dance was held in St Oswalds Church Hall February 7th 1948, although it was run at a slight loss, it was generally agreed that everybody present had a very enjoyable evening. 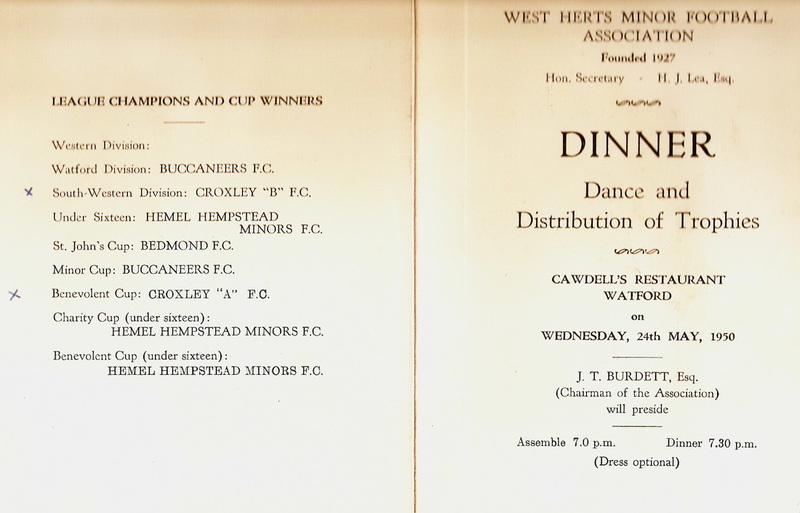 A very successful 1st Annual Dinner was held on 8th May 1948, during the course of which, two guests Mr. Davies (West Herts Post) and Mr. Whittle (Ex Councillor) both expressed their wish to see the club prosper and would do all they could to help. 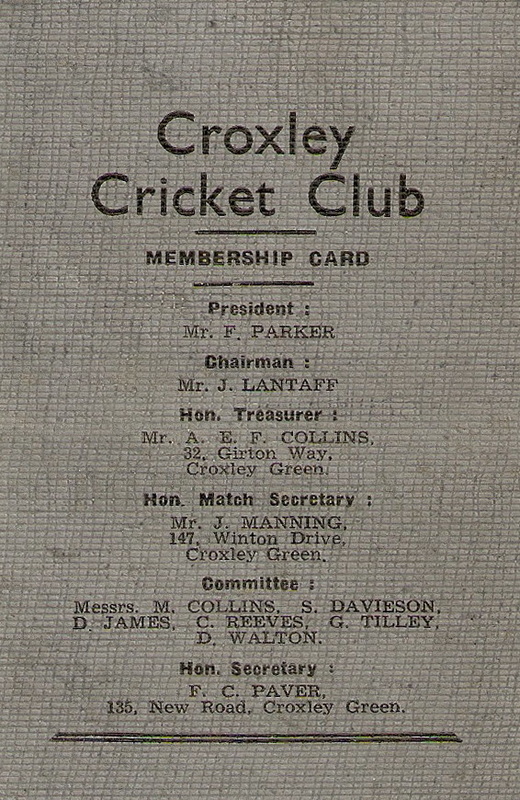 Although the Club were rather slow in making an impression on the people of Croxley, towards the end of the season more and more people were taking interest and it is hoped that when we start the season 1948/49 we shall have a far greater following both in Committee and supporters than the past year. 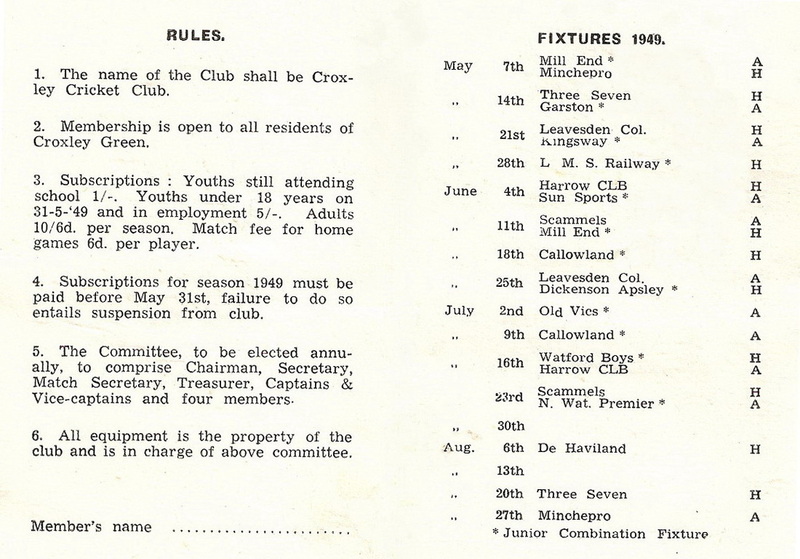 Minutes of the 1st Annual General Meeting held in St Oswald's Church Hall Croxley Green June 11th 1948. Owing to the absence of Mr. G Styles Mr. J Good was nominated to act as Chairman. 1st Item on the Agenda was the Secretary's report. 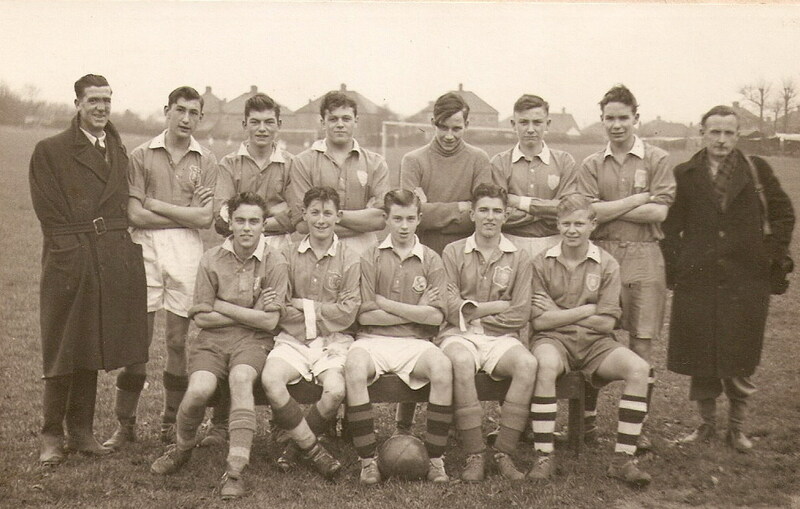 This related generally to the performance of the club during the 1947/48 season and to the way it had been received in the area. Mr. Good moved the motion that the report be accepted as a true statement. Mr. Hamblin seconded the motion, all present were in favour. 2nd Item on the agenda was the Treasurers report. Mr. Hamblin presented all the members of the club with a typewritten statement of accounts for the previous year. After going through the various items individually Mr. Hamblin then went on to say that various reports had reached him concerning a certain sum of money that the club was supposed to be in debt. This he said was perfectly untrue as the money had been lent to the club in order to buy the extra equipment needed for the coming season. In conclusion to the Treasurers report, Mr. Jeffrey moved the motion that a vote of thanks be recorded in the minutes book, to Mr. Hamblin for the splendid way in which he had fulfilled the position. This was seconded by Mr. J Good, all were in favour. Mr. Good then proposed that the statement of accounts be accepted as a true record, seconded by Mr. D Ballard, all were in favour. Item 3 Election of Officers Chairman. Mr. G Styles the late Chairman had written to the secretary declining the office for another season on account of his heavy duties as a School Teacher and as a married man. He had to tender his resignation with the deepest regret, but promised to do all he could for the club in the future should his services be required. It was agreed to accept his resignation. It was proposed by Mr. McBride and seconded by D Bowyer that Mr. Newman of 'Shangri La' Winton Drive be elected Chairman. This was agreed and passed. Secretary Proposed by D Ballard & seconded by C Ditton that Mr. Roberts to carry on in the office, this was passed. Treasurer Proposed by D Drury seconded by A Collins that Mr. Hamblin carry on as usual. This was passed. Presidents & Vice Presidents to remain the same except that the Secretary be instructed to write to Mr. Whittle, Mr. Payne, & Mr. Goodyear to accept the office of Vice President (passed & carried). 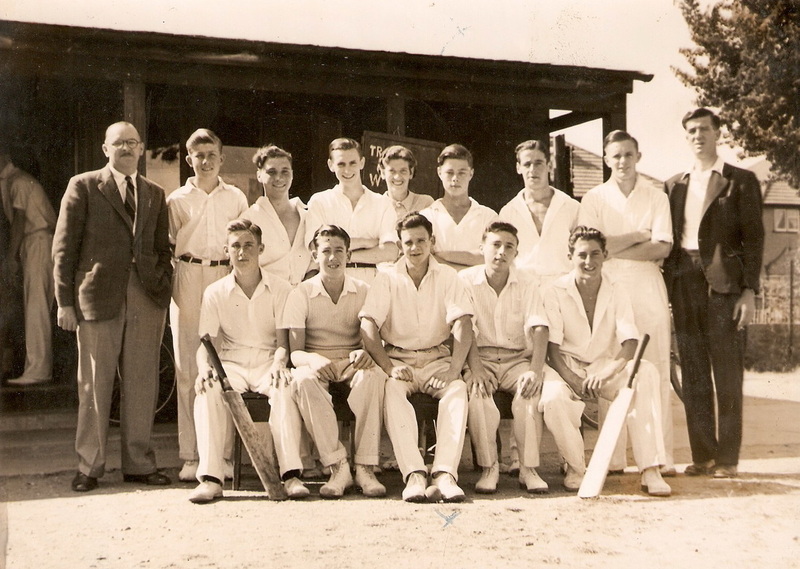 Team Management Owing to the resignation of Mr. G Smyrke it was proposed by D Ballard & seconded by R Tizzard that Mr. Good & Mr. Pettit be elected as team managers of the 1st eleven. All were in favour. Mr. Good replied on behalf of Mr. Pettit and himself. He thanked the boys for their confidence in them and that they in return would do all they could to help the team. 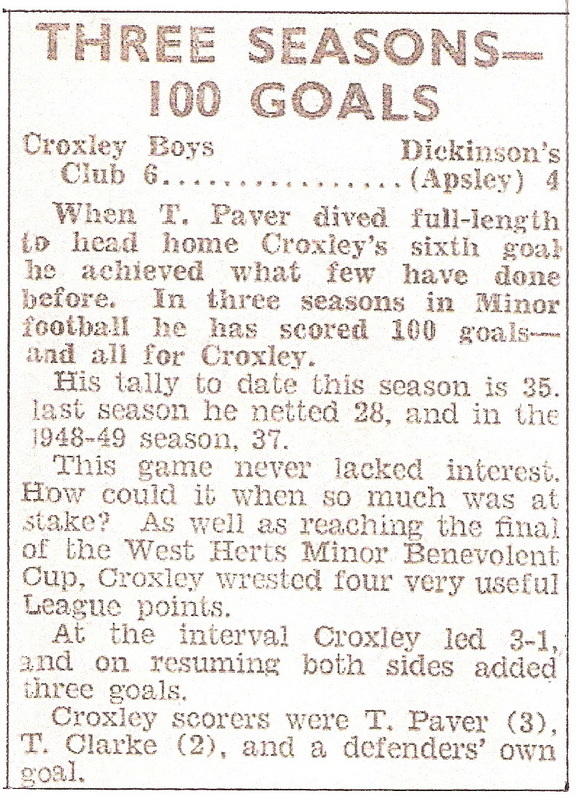 Next it was proposed by D Bowyer that Mr. Paver & Mr. Newman carry on as under 16 managers. This was seconded by D McClean, all were in favour. With regard to the 2nd eleven team management it was decided to leave it in abeyance until it was decided whether or not Mr. Weston was going to join the club. Selection Committee Proposed by Mr. Jeffrey that This committee to consist of the two managers and captain of each team and the general purposes committee to consist of 7 people namely, Mr. Newman, Mr. Paver, Mr. Good, Mr. Pettit and the two managers from the 2nd eleven when available & D Ballard. The Secretary & Treasurer to attend automatically. This motion was seconded by Mr. McBride and carried unanimously. 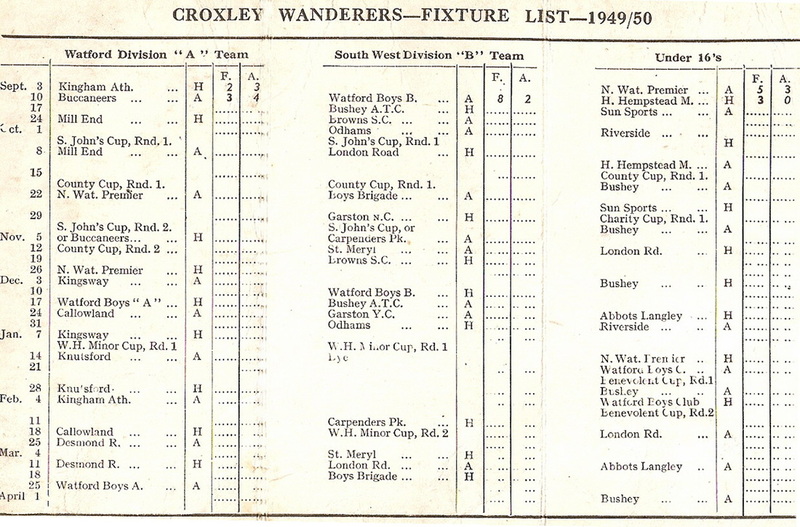 It was proposed by Mr. Jeffrey, seconded by D Walton that the rule relating to players must live in Croxley be deleted and in its place be inserted open to all areas, providing the committee satisfy themselves that the applicant is of the right type to uphold the prestige of the club. It was proposed by Mr. Hamblin and seconded by D Ballard that the fee be raised from 4/3 to 5/3 ( 4 shillings and 3 pence to 5 shillings and 3 pence ) for every member.Mr. Paver proposed and C Taylor seconded that the under 18's pay 5/3 and the under 16's pay 3/3. A vote was taken on the matter and Mr. Hamblin's motion was adopted by 14 votes to 5. Fees were payable after the 1st of August. Proposed by Mr. Hamblin that the Secretary should apply at once to the F.A. for a grant of coupons. The Secretary replied that he would attend to it. The book continues to unfold the development of the club and the following extracts relate to the progress of the club until the end of 1950 when this book finishes. The text is a précis of the minutes. Minutes of the 2nd Annual General Meeting 1st July 1949 in St Oswald's Church Hall. There were 29 members present. Mr. Hamblin was asked to perform the Chairman's duties owing to the absence of Mr. Newman. The Rev. R S Wilkinson was elected President again and the Vice Presidents en bloc. New names were submitted as candidates for the position of Vice Presidents and the Secretary was asked to write to, Mr. F Evans, Mr. Wilbee, Mr. B Davies, Mr. Pitkin, Mr. Thompson, Mr. Hamblin was voted Chairman for 1949-50, Mr. Paver voted as Hon Sec., Mr. Walton Treasurer. 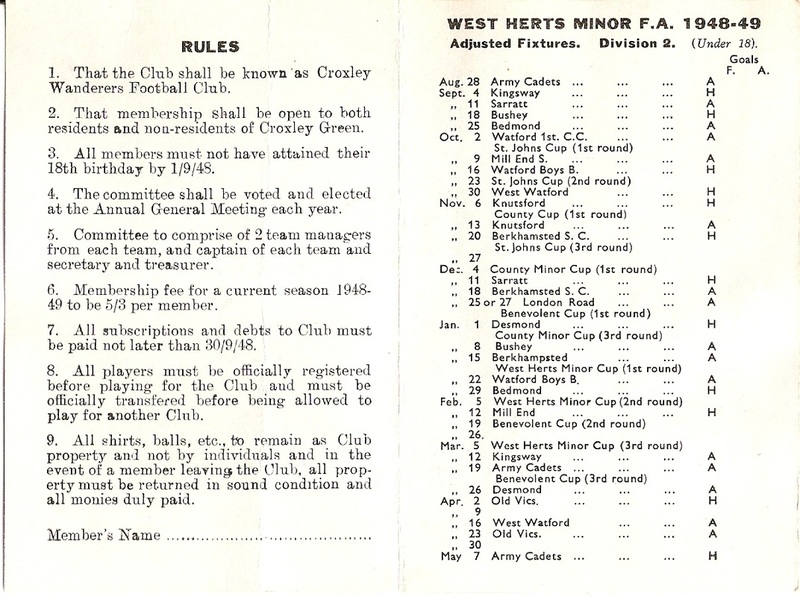 It was agreed to enter all the competitions for 1949-50 season officially recognised by the West Herts Minor League Football Association (WHMLFA). It was discussed whether the football pitches in the new recreation grounds in Baldwins Lane would be ready for the forthcoming season. Mr. Paver agreed to act as club representative at the Further Education Committee. Minutes of a General Meeting held on 22nd July 1949 at St Oswald's Church Hall. Present – Mr. Hamblin, Mr. Good, Mr. Manning, Mr. Walton, Mr. Paver and 29 members. Mr. Thompson spoke in a forthright and forceful manner regarding football training. Mr. Paver (Secretary) informed the meeting the club had been accepted to all the competitions. As 10 new teams had joined, the Under 18's would be in 3 sections: A B C.
Rickmansworth Urban District Council would meet the Secretary regarding the allocation of football pitches. The Fixture list was handed round. The Chairman said that efforts were in hand to try and obtain a clubroom so they could be affiliated to the National Association of Boys Clubs (NABC). Arrangements for a dance on the 24th September at the Guildhouse in aid of funds were in progress and the following bands, Billy Smith, Tommy Hunt and Stan Pike would be approached for quotes. Tickets 2/6d (two shillings and sixpence). An appeal was made for old footballs for training games. R Platt enquired regarding insurance schemes. Affiliation to the NABC would ensure comprehensive rates in case any players were to receive injuries. 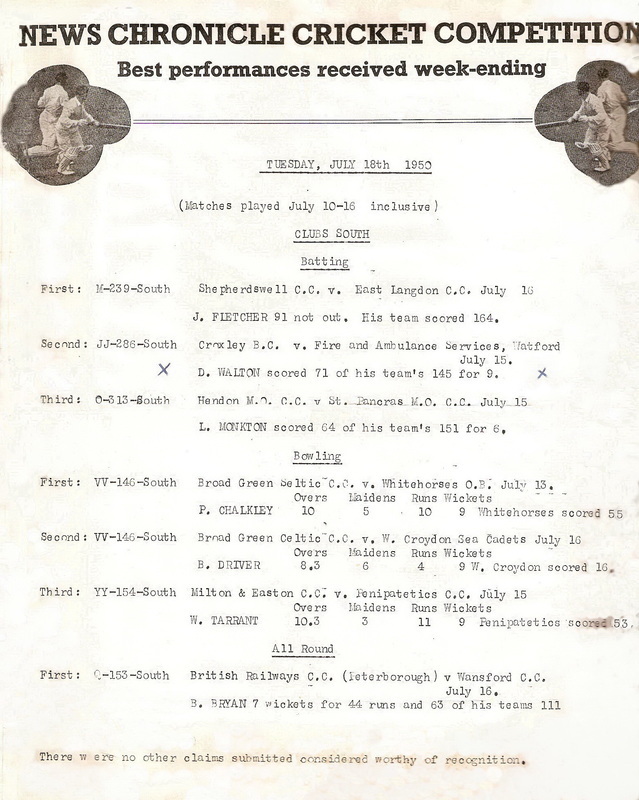 Minutes of Committee Meeting 24th August 1949 at 135 New Road. Present - Mr. Hamilton, Chairman, Mr. Paver, Secretary, Treasurer, Mr. Walton plus Mr.. Lantaff, Mr. Manning, Mr. S G Wilkins and Mr. R B Payne had accepted the positions as Vice Presidents. Donations were received from Lady Mary Heaton and Mr. Goodyear, recently moved out of the area. Rev Wilkinson offered a cup to be awarded to the best team each season. Donations were also received from Mr. E Wilbee, Mr. Whittle, Mr. Davies and their names would be added to the list of Vice Presidents. It was agreed to purchase 3 footballs, 3 ball nets, 3 knee guards and 18 sets of rules. Mr. Evans’ offer of a football was gratefully accepted. Mr. Walton, Treasurer, reported that the Post Office bank book was now adjusted and specimen signatures had been sent. The Secretary was asked to apply for a permit from the Food Offices to allow refreshments to be served at the forthcoming dance. He reported about a meeting with Mr. Mills, Herts Education Officer, who has given permission to use Durrants School – Tuesday & Thursday evenings at 1/- (one shilling) per night. Consequently a meeting with Mr. Jeffrey (Headmaster) was to be arranged and the Chairman, Secretary and Colonel Johnston would attend. Minutes of a General Meeting of members held on 1st September 1949 at St Oswald's Church Hall. Present -Chairman, Treasurer, Secretary, Mr. Lantaff and Mr. Fuller and 24 members. The Chairman introduced Mr. Fuller who has offered to assist in managing the 'A' team as Mr. Good was unable to carry on this season. 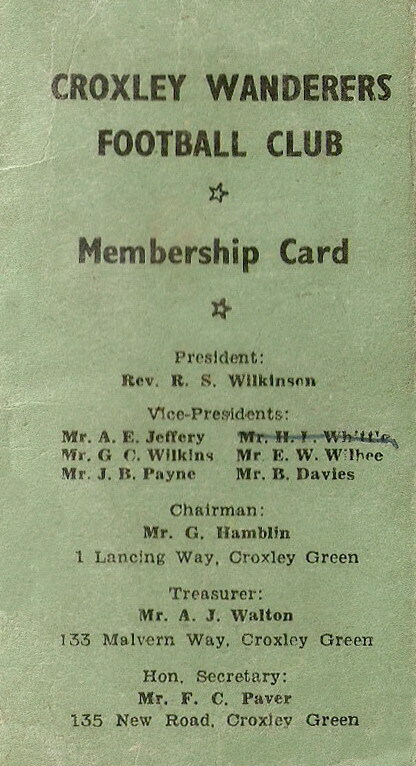 The past Secretary Mr. W J Roberts was the first to be offered the first life membership. The team selections were announced and captains and vice captains have been selected. 'A' Team, W Pettit / D James; 'B' Team, D McLean/ Clifford Taylor. Names for the Under 16's to be decided on Saturday 3rd September. The forthcoming dance arrangements were well in hand and special efforts were to be made to sell lots of tickets. Posters had been displayed in the district. News was anticipated soon about the opening of 'The Club' as soon as a reply from Mr. Jeffrey was received. Minutes of a Committee Meeting held at 1 Lancing Way on 19th September 1949. Present – Chairman, Secretary, Treasurer, and Messrs. Fuller, Lantaff, and Manning. A short report was received from the Secretary of a meeting of the W.H.M.F.A. held at Kingham Hall on the 8th September. The Secretary's report indicated that 51 boys had been signed up to play in both age groups. A fixture list for the forthcoming season was handed out. A problem with the council (Rickmansworth Urban District Council) regarding the charges they were imposing appeared too high and would be challenged. 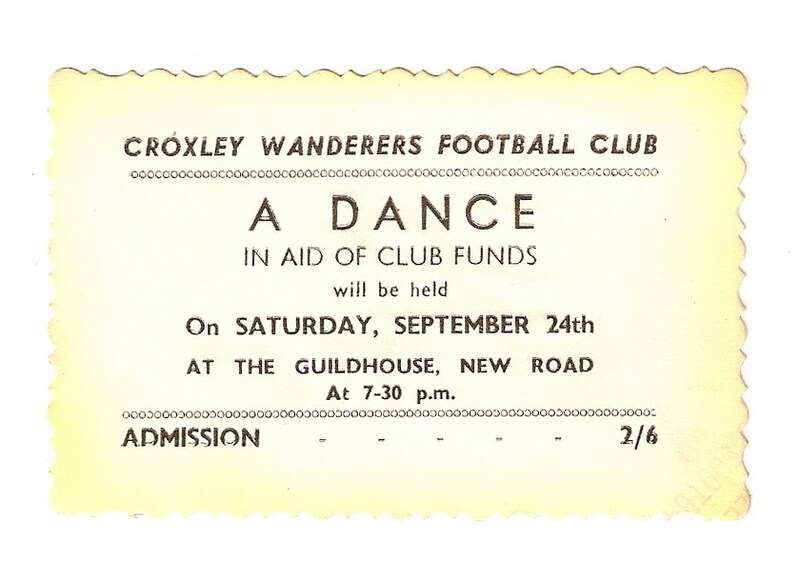 Many tickets had been sold for the dance and a good attendance was expected. A bottle of Port would be raffled at 6d (sixpence) a ticket. Four 'Spot' dance prizes to be purchased, 2 ladies and 2 gents. The Food Office had refused an occasional license so cakes and rolls were ordered from the Co-op. (Food rationing was still in place after the war). Donations of tea and milk were offered by the committee. Having met with Mr. Jeffery, he was said to be sympathetic to the use of the school but there were a number of difficulties to overcome. An offer from the Guildhall to hold a Thursday Club night for P.T. (physical training) classes would be accepted. Lt Col. Johnston and Mr. Mills were asked to attend the inaugural meeting 29th September. Mr. Jeffrey would loan some equipment. The Secretary was asked to enquire about facilities at the Old Boys' School. Mr. Fuller spoke about a possible game with Brighton Boys at Brighton. The Treasurer was instructed to buy a small quantity of first aid equipment that could be shared between the teams. Minutes of a Committee Meeting held 1 Lancing Way on 28th October 1949. Present – The Chairman Mr. Hamblin presided, Secretary, Treasurer, Messrs. Fuller, Manning. The Secretary reported on the recent games that had been played. Games would be arranged for boys not selected for the teams. The Secretary had attended a meeting at the W.H.M.F.A. 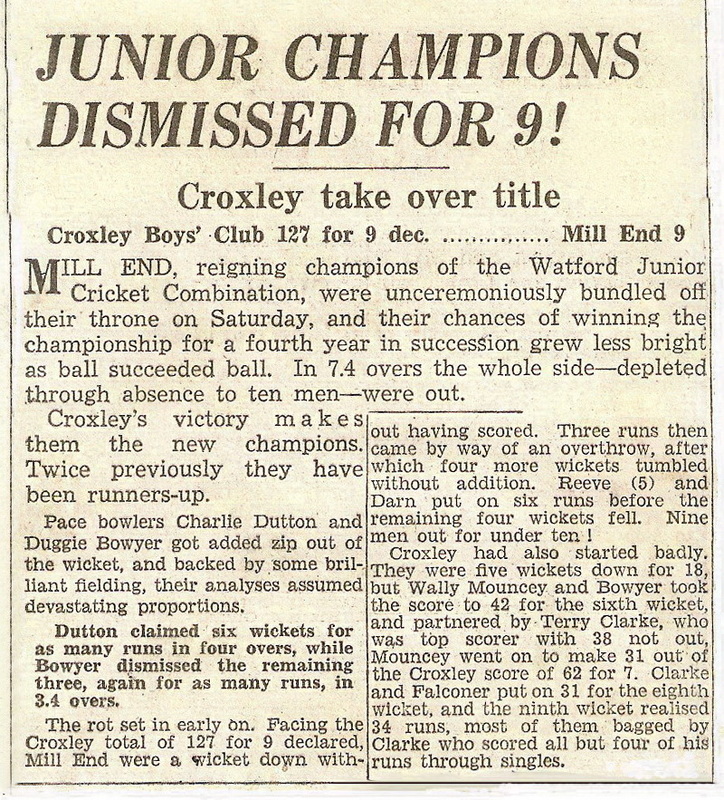 and the Croxley Youth Committee (a ‘Youth Week’ was proposed for early January 1950). A game with the Brighton boys football club at Brighton was going ahead with a morning fixture. Dates to be agreed. The boys had requested another dance and the Secretary asked to arrange this in December in All Saints Hall, possibly having Billy Smith's band for the event. The Secretary was asked to arrange another Whist Drive at the Guildhouse. £8 was currently the club funds and £2 10s profit had been made from the previous dance. 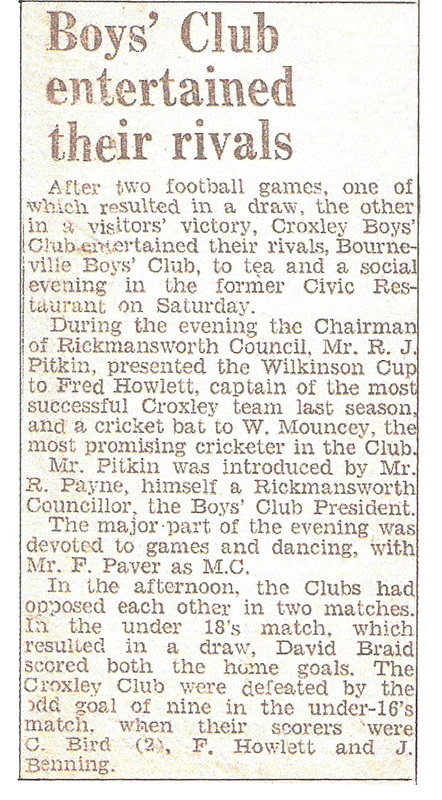 It was suggested that as the Youth Club and Football Club were merged would it be possible to include the Cricket Club. The Secretary would write to the Cricket Club. Minutes of a Committee Meeting held at 135 New Road on 16h December 1949. Present – Secretary, Treasurer, Messrs. Manning, Fuller, Pettit, James, McLean, Bowyer, Mr. Manning was voted to take the chair. As the Xmas draw was to take place that evening it was agreed to keep the business to a minimum. Apart from the general correspondence that had been received and discussed the Treasurer expressed concern regarding the lack of funds. Minutes of a Committee Meeting held at 135 New Road on 23rd January 1950. Present – Secretary, Treasurer, Messrs. Fuller, Manning, McLean, Pettit, James, Taylor. Brighton F.C. agreed a friendly fixture with the club for 1st April. Coaches would require organising and the 'B' team would represent the club. 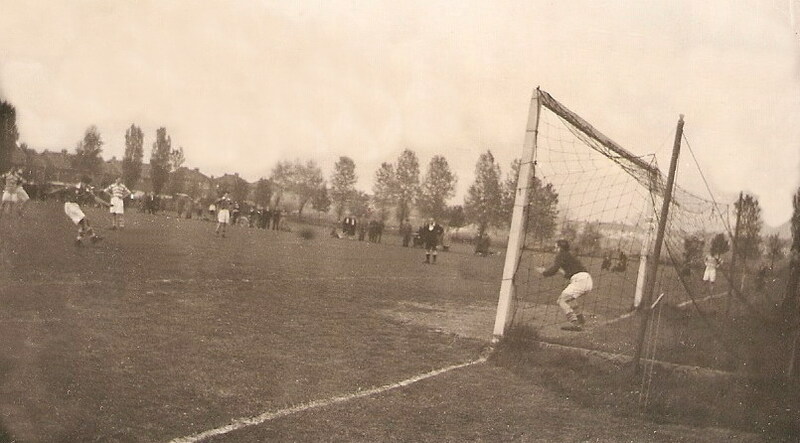 It was suggested a 'friendly game' could also be organised on the same day for the 'A' team. Mr. Fuller would try to organise a meal they could all have together. The 'A' team had been entered into the 16-18yrs Benevolent Cup. A letter from the N.A.B.C. confirmed the club was admitted to associate membership. It was voted on and agreed that the premium (payment) would cover 56 boys and 6 adult helpers for normal benefit rates. In the boxing section 3 boys were entered for N.A.B.C championship. The first stage would be held at Welwyn. The club would pay half the boys’ fares to this event. During 'Youth Week' members were asked to enter exhibits into the art and crafts displays.Mr. Walton, Treasurer, reported cash in hand was now £15 11s 9d. He urged strictest economy but in view of possible cup finals 1 dozen pairs of socks should be purchased. This was agreed. More adults were needed to run the club. Names were put forward to be contacted. Mr. Hamblin, Chairman, unfortunately had to offer his resignation and on a vote was made a life member of the club. Minutes of a Committee Meeting held at 135 New Road on 27th February 1950. Present - Secretary, Treasurer, Messrs. Manning, Thompson, McLean, Taylor, Mr. Thomson was asked to take on the Chairmanship and would consider this. Mr. Manning would deputise for this meeting. The Secretary gave a report on the N.A.B.C. boxing at Welwyn. The coach was now booked for the Brighton trip @ 10/6 per seat and quotations for a light meal at Brighton would be sought. Youth Week – the club would provide 'sidesmen' at All Saints and a choir. An exhibition of photographs and arts and crafts would be on display and a football match arranged. Mr. Walton would be assisted by Mr. J Mathews with the choir and was well known for this type of work. The cricket team was entered into the Watford Junior Combination. A Whist Drive was proposed to be held at the Guildhouse to raise funds. Two dates would be fixed and local tradesmen approached to help with prizes. Minutes of a Committee Meeting held at 135 New Road on 27th March 1950. Present - Messrs. Manning, Walton, Mathews, Fuller, Taylor, Pettit, McLean, Paver (Hon Sec).Mr. Manning took the chair and welcomed Mr. Mathews as a new member of the committee. The Brighton trip was well in hand. Supper for this trip would cost 2/6d but club members would get a reduction. Dates for the Annual Dinner and the A.G.M. were discussed. Reports from the monthly W.H.F.M.A. 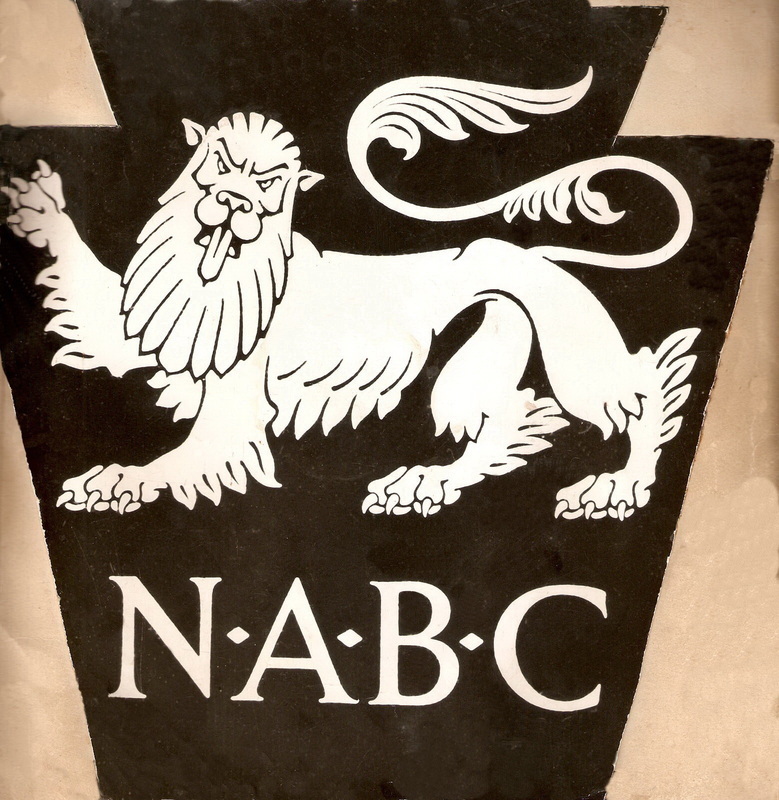 meeting, recent Whist Drive, and various correspondence from the N.A.B.C. were given. Mr. Eric Thompson regrettably could not serve on the committee. The Treasurer reported £13 cash in hand and again warned against unnecessary expense. The forthcoming Whist Drive should provide more funds as expenses would be 15/- (fifteen shillings) less as the tickets had been printed free of charge. Problems with the junior cricket team had been resolved and it was agreed to disband the team.Mr. Mathews reported on the choir and he was getting good results from the boys and they stood a very good chance at the Hitchin Festival on 6th May. Mr. Walton put forward an idea of a 'jumble sale' to assist funds; Mr. Manning suggested a 'sale of work' was a better title and this would be discussed at the next meeting. Mr. Walton offered his house to hold the meeting. Minutes of a Committee Meeting held at 133 Malvern Way 23rd April 1950. Present - Messrs. Manning, Fuller, Walton, Tibbles, Paver (Hon Sec ). The quotation from the Watford Co-op was accepted for the annual dinner to be held at St Oswald's Hall on 20th May at 6/6 per head. Invitations would be sent out including to the President and Vice Presidents. A vote of 4-1 against ladies attending was taken but this would be put to a general meeting in May. The Secretary would arrange speeches and presentation of trophies. It was suggested the choir could perform a few 'numbers' and dancing and games fill the rest of the evening. Mr. Hamblin would be M.C. The assets from the disbanded Croxley Cricket team were handed over and amounted to £12 8s 0d cash. To join the Club cricket section would be 3/- subscription plus 6d per game. A meeting of members was arranged for 2nd May and the first game against Kingsway C.C. was 6th May. The Treasurer Mr. Walton reported he would bulk all the subscriptions and donations into one account which was endorsed by the committee. The recent Whist Drive had made a profit of just over £5 due to the generosity of local traders. The Secretary reported on the results of the league positions and other results. Congratulations to the 'B' team for winning their first league shield and the 'A' team were in the final for the Benevolent Cup to be played in the next two weeks. The outcome of a successful trip to Luton resulted in the darts team winning the Youth Championship of Bedfordshire. A member D.P. McBride also won the individual title. B Element was award the 'best club boy' trophy although several boys were contenders. Minutes of a Committee Meeting held at 133 Malvern Way 2nd June 1950. Present, Messrs, Fuller, Manning, McLean, Taylor, Walton, Paver. A report on the Dinner was given with a loss of £3. This compared favourably with last year's Dinner which incurred a £7 loss. The number of complimentary dinners was seven and the Chairman remarked the event was a success. The Treasurer reported they had £16 cash in hand, a reduction of £14 since the previous meeting. Arrangements to have photographs taken of the Under 16's and 'B' teams on Sunday 4th June by Mr. D Clarke were agreed. Medals were discussed and 14 would be awarded. Minutes of a Committee Meeting held at 133 Malvern Way 3rd July 1950. Present: Hon Secretary, Treasurer, Messrs. Manning, Fuller, Reeves, McLean, Taylor.Mr. Manning took the chair and correspondence was read out including a letter from the Education Officer regarding bookings and charges. A quotation from the Guildhouse was received for a dance to take place 2nd September. Prices to be obtained from Billy Smith and Stan Pike, local bands. A quotation from the Guildhouse for a Whist Drive in the Science Room every 2nd Thursday in the month was also agreed. The News Chronicle results were circulated and congratulations were offered to Derek Walton who had obtained 4 points for the club. £22 had been raised by the sale of 'Football Trebles'. The choir had been booked for two occasions in December. Minutes of the AGM held at Durrants School 18th July 1950. Present: The President Cllr R Payne plus Mr. Manning, Chairman, Mr. Payne, Honorary Secretary, Mr. Walton, Treasurer, Messrs. Fuller, Mathews, Reeves, Ashover, Weston and 23 members. The President congratulated the 'A' team who won the Benevolent Cup, 'B' team for winning the South West Herts Division League Shield and the Under 16's for runners up in their section. The Choir and the Darts team were congratulated for their successes. He thanked the committee and members for their continued support. The Treasurer announced the cash balance was £12 18s 6d. The current Chairman, Secretary and Treasurer were reelected. The Secretary reported three teams were entered into next season’s W.H.M.F.A. Football training to be held every Wednesday at Baldwins Lane recreation ground from 26th July. Minutes of a Committee Meeting held 135 New Road 12th September 1950. Present: Messrs Manning, Walton, Mathews, Taylor, Taylor, Newman and Hon Secretary, Mr. Manning was elected as Chairman. The Treasurer reported the club assets were dwindling. Urgency for subscriptions to be paid on time was paramount. The Secretary reported that P.T. (Physical Training) classes would recommence with 4d for Under 16's and 6d for Under 18's per session. Club nights would restart 7th September at 4d per member. Mr. Manning and Mr. Mathews agreed to run the next Whist Drive. Mr. Manning stated the next choir night would be 4th September and if more boys joined he could offer a full programme. Minutes of a Committee Meeting held 135 New Road 25th October 1950. Present: Messrs. Manning, Walton, Roberts, Reeves, Mathews, Taylor, Paver (Hon Sec). Mr. Roberts was welcomed back. The Secretary reported on the games already played and due to the increase in the number of boys under 16yrs a 'B' team would be established. Mr. Roberts has taken over this team and purchased and presented a set of jerseys to the club. A hearty vote of thanks was given for this generous gift and for the Secretary's action in entering the team into the league. Membership now stands at 55 boys. Mr. Reeves was thanked for helping on P.T. Nights and for collecting subscriptions. By kind permission of Mr. Thompson, New Road, photographs and trophies were on display. 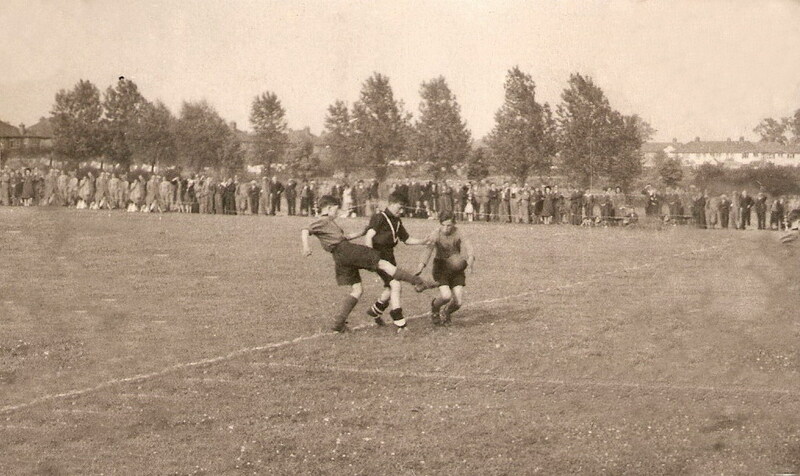 A match at Birmingham with Quinton Colts F.C. was arranged for 25th November. The quotation from Croxley Coaches was accepted at £12 6s 6d with the possibility of a second coach being required. Regarding the Whist Drive, following a letter from the Secretary a reduction in the cost of the hiring of the hall to 15s (fifteen shillings) was agreed. The next two dates booked were 9th November and 14th December. Mr. Manning hoped to arrange a party from Sarratt to attend the next event and it was decided to provide prizes and refreshments at a charge of 1/6d (one shilling and six pence). Members were asked to prevail on their wives to donate the refreshments. A letter was read from Mr. Jeffery (Durrants School Headmaster) requesting a donation of a table-tennis table to help Little Green Lane club, when the new one on order had arrived. The Treasurer reported the funds were dangerously low as subscriptions were slow to be paid. He agreed to assist Mr. Manning with the 'B' Under 18's team and would be at Baldwins Lane for their next game. Mr. Mathews reported he had the services of a pianist and hoped the numbers in the choir would increase. Minutes of a Committee Meeting held 147 Winton Drive 27th November 1950. Present: Mr. Manning, Mr. Paver, Mr. Roberts, Mr. Reeves. Mr. Roberts gave a report on the proposed clubhouse and thought the council (RUDC) might consider some sort of joint ownership. The committee would not give their support to this. The Secretary reported on the recent Whist Drive with a profit of £1 2s 6d. Mr. Manning was thanked as he had organised it. A special vote of thanks went to Hazel Wilkins who had almost single handedly provided the refreshments. It was agreed that at the next Drive the prizes would be of the ladies or gents variety. 1st prize Cockerel kindly presented by Mrs. Roberts, 2nd prize Bottle of Sherry, 3rd prize Hamper. The Secretary would purchase a basket of fruit for the raffle prize, the cost to be borne by the committee. 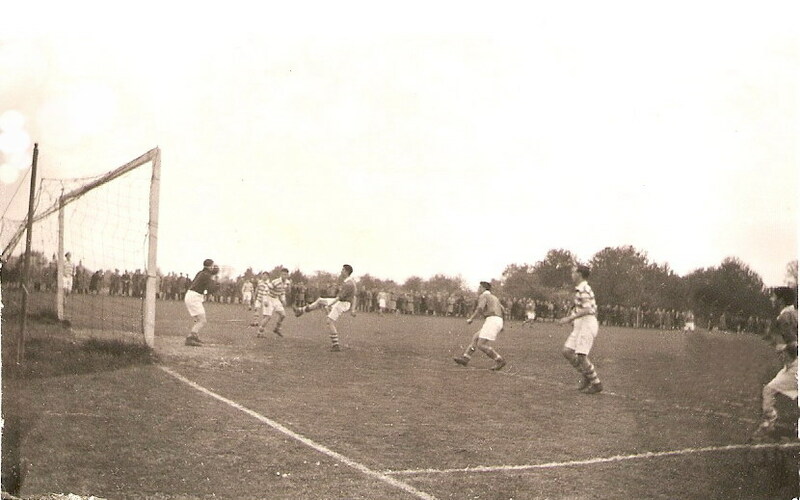 It was agreed to hold football games on Boxing Day between the 'A' and 'B' teams. The first game 10am. Minutes of a Committee Meeting held at 135 New Road 15th December 1950. Present – Manning, (Chairman), Messrs. Reeves, Packman, Taylor, Roberts, Paver (Hon Sec ). The Chairman welcomed Mr. Packman to the Committee and expressed the wish that he would find interest and enjoyment in the efforts of club work. Johnston would be asked to attend. The Whist Drive made a profit of £7 9s 9d and credit was due to all those who had assisted with this successful Drive. It was proposed that a N.A.B.C. diary be sent to the President with their compliments. Minutes of a Committee Meeting held at 135 New Road 31st January 1951. Present: Messrs. Packman, Reeves, Roberts, Hon. Sec., Hon. Treasurer & Chairman, Mr. Manning. The Secretary reported on the current positions of the football teams – results and positions. Refreshments are now available on Club Nights. Table tennis matches proved a problem for finishing and closing on time. The Secretary was asked to contact the Caretaker and Headmistress of Malvern Way School with a view to obtaining alternative accommodation. The Physical Training classes were well attended and it was envisaged a team could be entered into the N.A.B.C. display at Wembley. Mr. Reeves and Mr. Caffall had selected 14 boys from which a team would be selected. Mr. Packman was assured of the Committee's support in starting a cycle section. Paul Clarke was entered in the Class 'A' boxing section fighting at Luton on 20th February. He has every possibility of winning a county badge. Best wishes for his success were expressed by the Committee. Barton Way recreation ground had been booked for the forthcoming cricket season for home fixtures and Baldwins Lane recreation ground for practice games. Mr. Manning agreed to M.C. (Master of Ceremonies) the Whist Drive on 8th February. It was agreed to award Saving Stamps as prizes and the Secretary would purchase tinned meat for the raffle prize.Mr. Packman relayed the recent Croxley Youth Committee Meeting’s decision that Youth Week would coincide with the District's Festival of Britain celebrations. There would be an Arts and Crafts Exhibition at St Oswald's, a Variety Concert at the Guildhouse, a dramatic night at All Saints (One hopes that the minutes refer to a drama play! ).The week is intended to begin with a Youth Service at the Methodist Church. Mr. Roberts reported on a meeting with R.U.D.C. with regard to the council purchasing spare land near Baldwins Lane recreation ground. He emphasised this was a slow process. The Annual Dinner was discussed and it was agreed that a Dinner/Dance be approved with music by Radiogram. Minutes of a Committee Meeting held 1 Richmond Way 21st February 1951. Present: Chairman Mr. Manning, Messrs, Packman, Reeves. Roberts, Hon. Sec, Hon Treas. The Secretary was pleased to announce the improvement of the Under 18's 'B' team. He also reported on a meeting he attended with Mr. Reeves at Lucas Tooth Gym 11th February regarding the P.T. Section. Dates for the mass displays at the Empire Pool (Wembley) would take place on 17th &18th May and 19th May at the Wembley Stadium. An individual display (each club) would perform on 27th May at the Festival of Britain. A ladder had been loaned by the N.A.B.C. The kit would be white vest and shorts, socks and slippers. Badges would be provided by N.A.B.C. 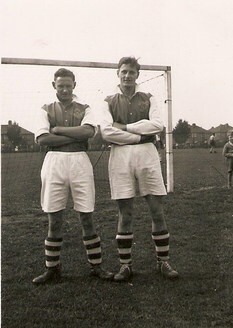 Captain Cole would visit the club on two occasions to assist with the training. Expenses to Battersea would be met by the N.A.B.C. Suggested date for the Annual Dinner 5th May. The menu available at 7/6d (seven shillings and sixpence). Letters would be sent to parents encouraging them to attend. To cover expenses 8/- (eight shillings) would be charged. Profit from the Whist drive amounted to 31/0½d (£1 11s 0½d ) Another Whist Drive was booked for 8th March. Mr. Packman gave an updated report on the Youth Committee and Youth Week. The Chairman and Secretary would be delegates representing this Committee at the South West Herts Youth Committee. 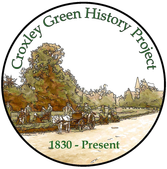 Between 21st February and 8th June the minute book notes that several sub committee and informal meetings were held regarding the Cricket Season, Annual Dinner, Festival Celebrations and Annual General Meeting. These would be reported on at the next committee meeting. 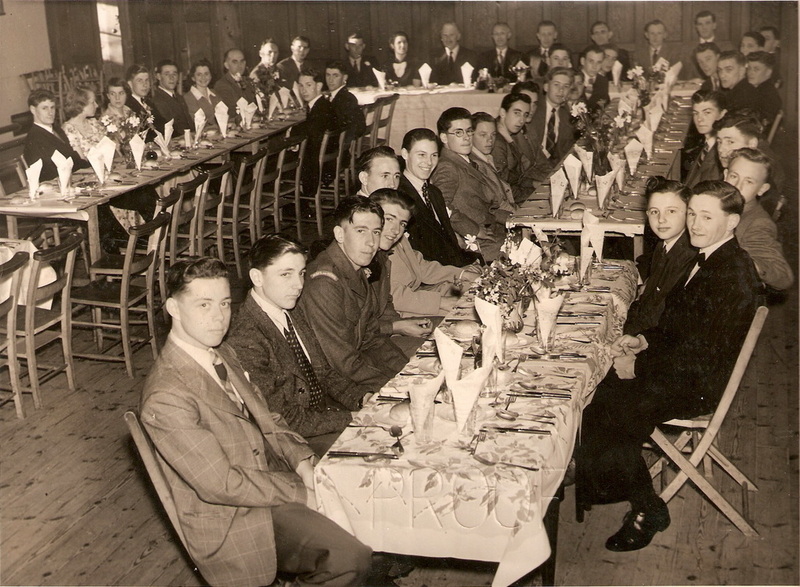 General Meeting held Durrants School June 8th 1951. The chairman was Mr. Manning. Those present: Messrs. Packman, Reeves, Hon Sec. and 20 members. The Secretary gave his report for the previous year and as he had also combined this with acting Treasurer the financial report was given. A vote of thanks was accorded to him. The following year's Officers were elected. Committee members: Messrs. Reeves, Roberts and Packman. Approval was agreed to co-opt other members. The Secretary reported he would enter the club into the usual competitions seeking approval for as much support to the club officers. Club nights and P.T. (Physical Training) would continue as usual. Election of captains for the football season would be decided nearer to the start of the season. Committee Meeting held 97 Malvern Way 15th August 1951. Members present: in the chair Mr. Manning, Messrs. Falconer, Reeves, Packman, Roberts and the Secretary. The Secretary reported briefly on the Annual Dinner, Festival Celebrations, and the cricket season to date. The Chairman requested that mention be made in the minutes of the excellent work done by the ladies in preparing and serving the meal at the Annual Dinner. This suggestion was received with acclamation. Complimentary remarks were made regarding the Festival Celebrations and especially to Mrs. Pam Manning for her poster work. The Secretary promised to give a complete report on the cricket season at the next meeting. Football. The Secretary suggested that only one Under 16 team be formed this season but he would try and arrange 'friendly' matches for those not chosen. Lack of team managers and grounds were the reasons given. Mr. Hill and Mr. Rhodes would be approached to see if they would be interested. All cup matches available had been entered. 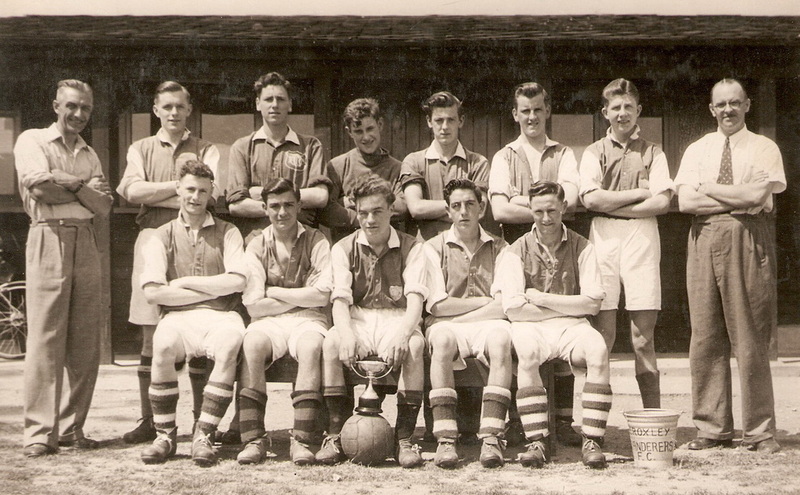 The 'A' Team under 18 year team were the current holders of the 1950/51 Wilkinson Cup. Senior Section. Mr. Roberts gave a short report on their progress. 1. The team was in Division 2 of the Great Western Combination. 2. They were entered into the Cup matches. 3. 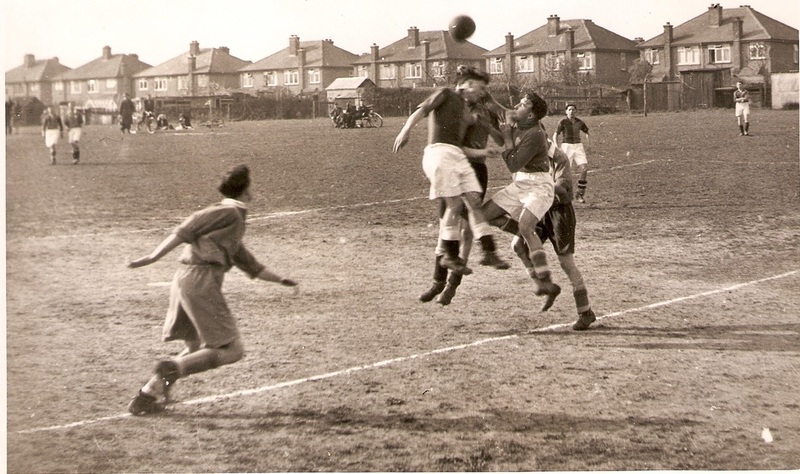 Improvements to the football grounds had been suggested to the council (R.U.D.C.). 4. Mr. Roberts agreed to take on the Secretary's role this season. 5. Miss Wilkins agreed to take on the Treasurer's position. 6. Training facilities have been arranged with Old Merchant Tailors (OMT) Durrants House grounds. 7. A football pontoon had been organised on a large scale. Mr. Roberts suggested if the boys' section could be included any profits accrued, would be shared. 8. Three dances had been arranged for the forthcoming year and more planned for 1952. The Secretary reported he had booked Durrants School for club nights as well as P.T. 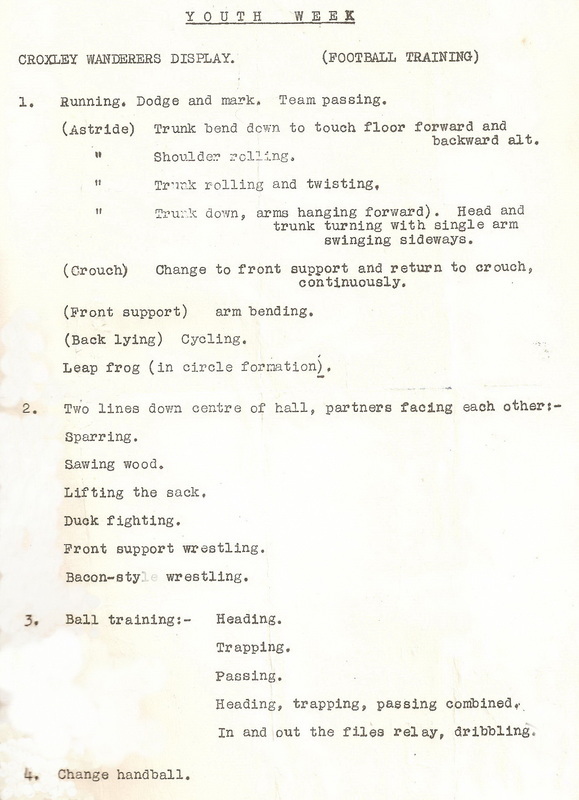 (Physical Training) but this may have to change to Little Green School. The next meeting was arranged for Tuesday 18th September. Committee Meeting held 74 Winton Drive 18th September 1951. Mr. Manning took the meeting as Chairman. Members present: Mr. Reeves, Mr. Reynolds, Mr. Packman, Secretary, Treasurer. The Chairman welcomed Mr. Reynolds to the committee. Mr. Wilbee, a Vice President, had recently passed away. The Hertfordshire Education had informed the club they could not grant permission for a hut to be built on school premises. Progress was being made for club nights at Little Green School. The Treasurer reported the cricket section accounts had been received. The team captains would be invited to the next meeting at Mr. Packman's house. Committee Meeting held 39 Repton Way 16th October 1951. Members present: Messrs. Packman, Reeves, Falconer, Adams and Hon. Sec. The Secretary reported confirmation from the Hertfordshire Education Committee regarding booking Little Green School for club nights on a Wednesday evening 7.30pm- 9.45pm. A request from the boys was raised to have a match at Birmingham. 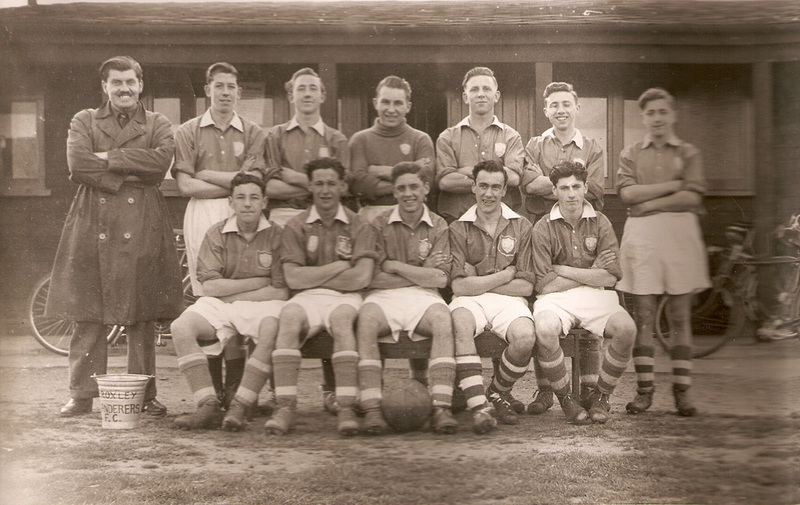 The Secretary would contact Cadbury to arrange 2 matches in January. P.T. would be held every Thursday in Durrants School gym. The results of the games played to date were given, including table-tennis. A Christmas draw (raffle) would take place as per last year. Mr. Falconer generously offered to pay for the Whiskey prize. Committee Meeting held 135 New Road 20th November 1951. Members present: Messers. Adams, Packman, Reeves, Hon. Secretary, Hon Treasurer. In the absence of the Chairman, Mr. Packman was elected to take the chair. The Secretary reported that the only correspondence received concerned day to day matters and they had been dealt with. The match results to date were recorded. The Treasurer stated there was an adverse balance when he arrived for the meeting but he was handed a cheque for £11 11s 7d (Eleven pounds, eleven shillings, seven pence), the club’s share in the first monthly 'pontoon', and declared a credit balance of £9. He stated that he felt confident that the club had now turned the corner financially. There was no member present to report on the 'Seniors' activity. The Secretary stated the Xmas Draw tickets had been sent out and hoped for a sell-out. Both the Secretary and the Treasurer hoped prizes would be donated for the Xmas Whist Drive. A Resolution was passed, proposed by Mr. Reeves and seconded by Mr. Packman, that the club open an account with the Westminster Bank. This received unanimous support and the Treasurer would take the necessary steps immediately. Committee Meeting held 135 New Road 18th December 1951. Mr. Manning took the Chair, members present: Messrs. Reeves, Packman, Chamberlain, Hon Secretary, Hon Treasurer. The Treasurer reported that both he and the Secretary had been accepted as signatories for the bank and asked the committee's approval for the actions they had taken. This was unanimously given. The Secretary reported there had been problems with the football fixture games that were due to be played15th December with double bookings with the pitches and bad weather conditions. The committee endorsed the action the Secretary took in addressing the situation. 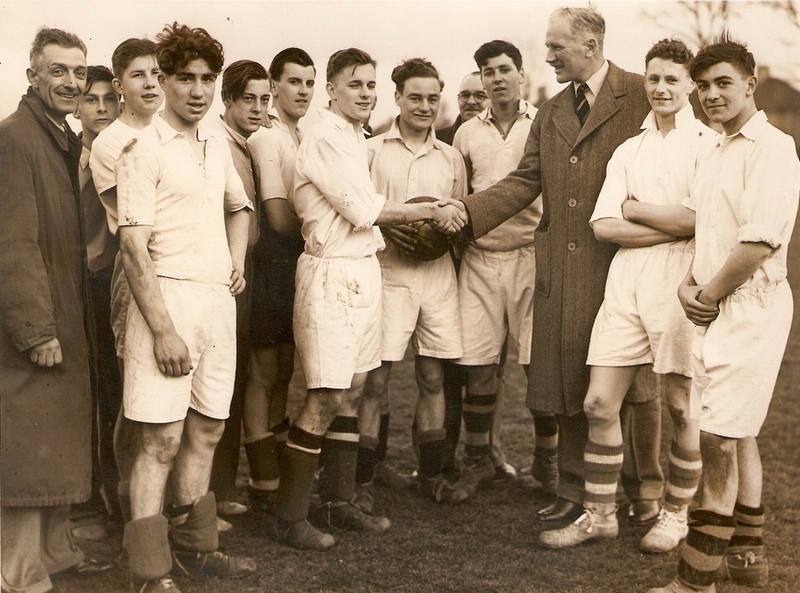 A letter from Bournville offering two football fixtures on 12th January 1952 was accepted and it was agreed to proceed with immediate arrangements for this trip. A letter from the N.A.B.C. regarding the ladder was discussed and a reply would be sent that Mr. Walton had already returned it. Mr. Falconer reported a cheque had been received for £16 from the football pontoon and the balance in hand was now £30. He would give a more detailed account at the next meeting. Great satisfaction was expressed at the improved position. The results of the Xmas draw were given. The scrap book that accompanied the Minute Book contains photographs, memorabilia and newspaper cuttings of these early events. 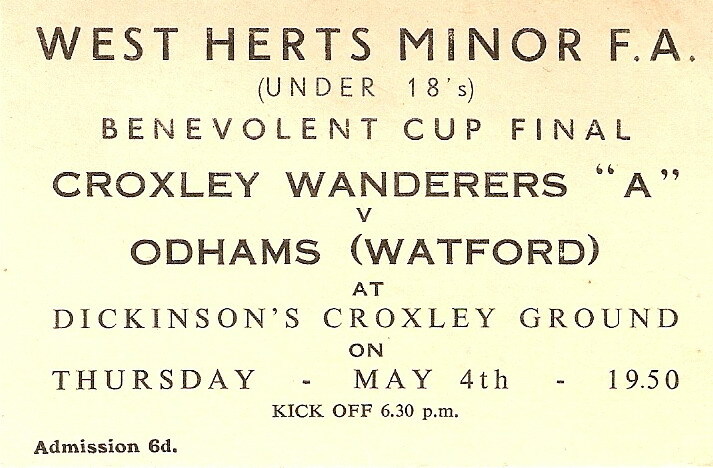 They relate to the Croxley Wanderers Football Club including the National Association of Boys' Clubs that encompassed other sporting activities. Due to the natural decline to the condition of this material some items are now poor in quality, these have been enhanced where possible, others are included for historical interest. Dates etc were not always recorded for many of the photo's or cuttings in the scrap book, but where possible, this information has been added. © A possible goal saved here! Barton Way recreation ground ! 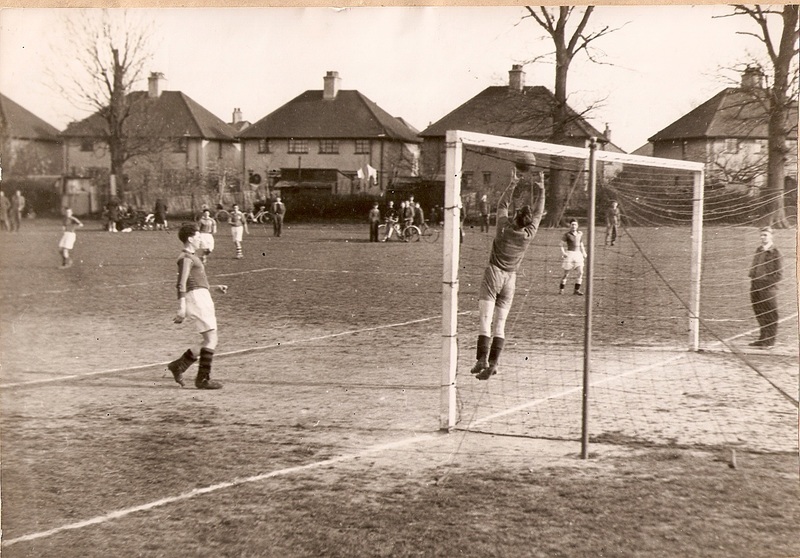 © A Saturday game in Barton Way - a stout defence! 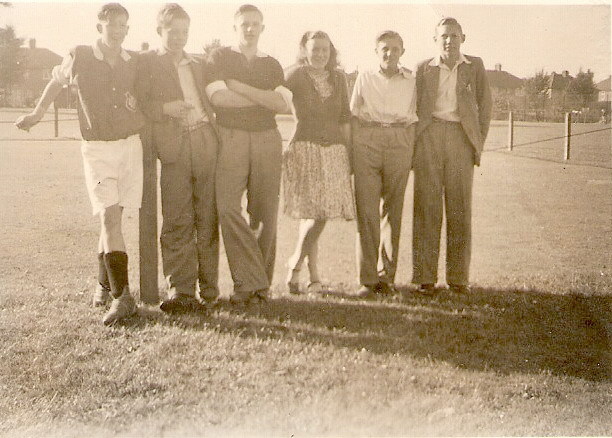 The setting up of this boys' club occurring soon after the Second World War highlights the growing fellowship between the long established residents and the newcomers to the village as they settled into a new environment. 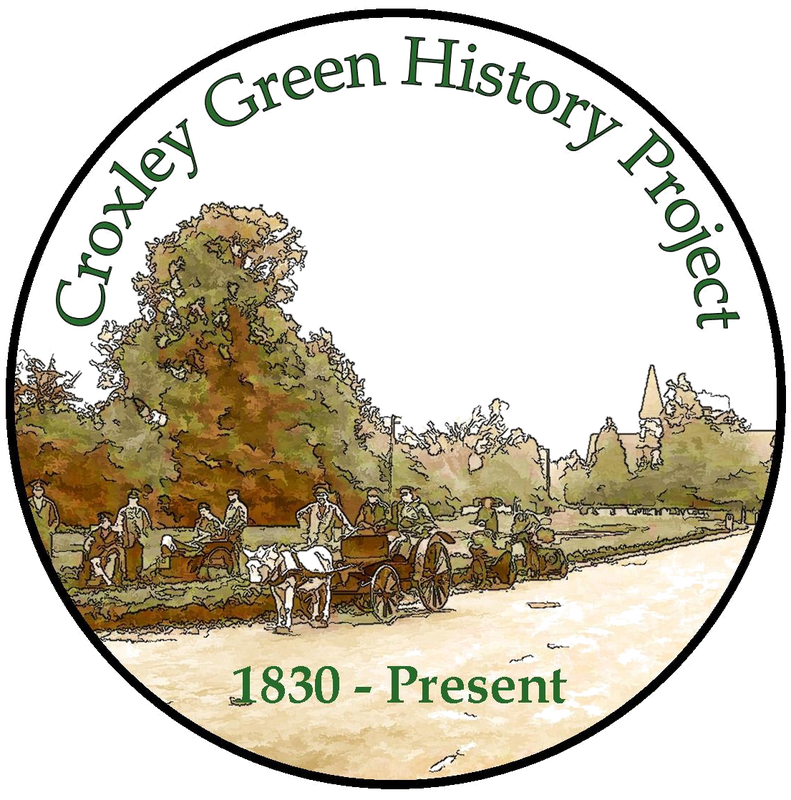 Croxley Green during the 1930's had quite quickly evolved from just a small village into a large ribbon development of streets/roads and hundreds of new homes. Although this new community had readily come together and produced hugely popular celebrations for the 1935 and 1937 royal festivities new and old residents were soon faced with the complexities of the Second World War. Once more fathers and sons left home to fight abroad but now they were joined by the women folk. Those left behind were confronted with 'running' the village as well as helping the influx of children from the bombing in London. 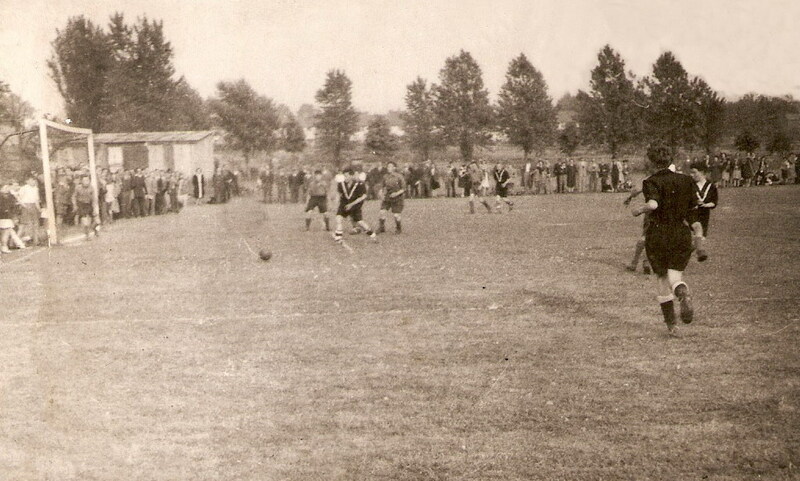 Although the boys' club usually played relatively local teams they were also invited to play teams much further a field particularly with football matches. 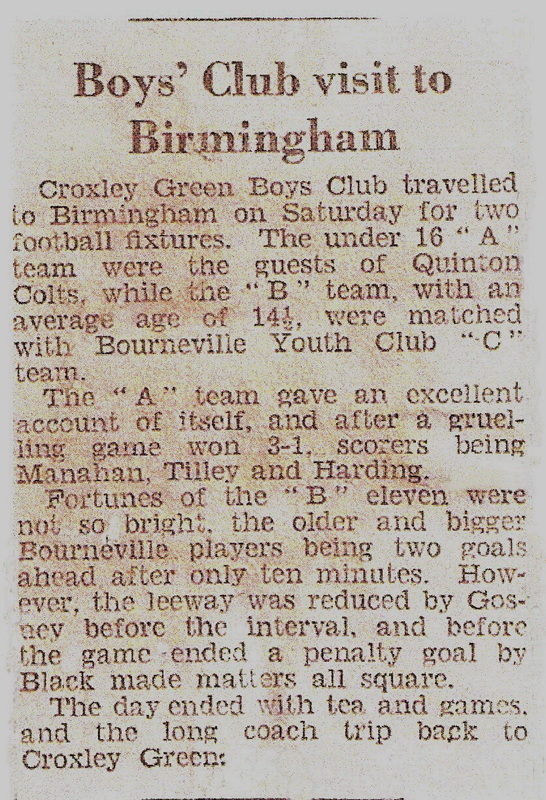 Bournville, Birmingham as well as Brighton and Hove Colts were mentioned in the early days. 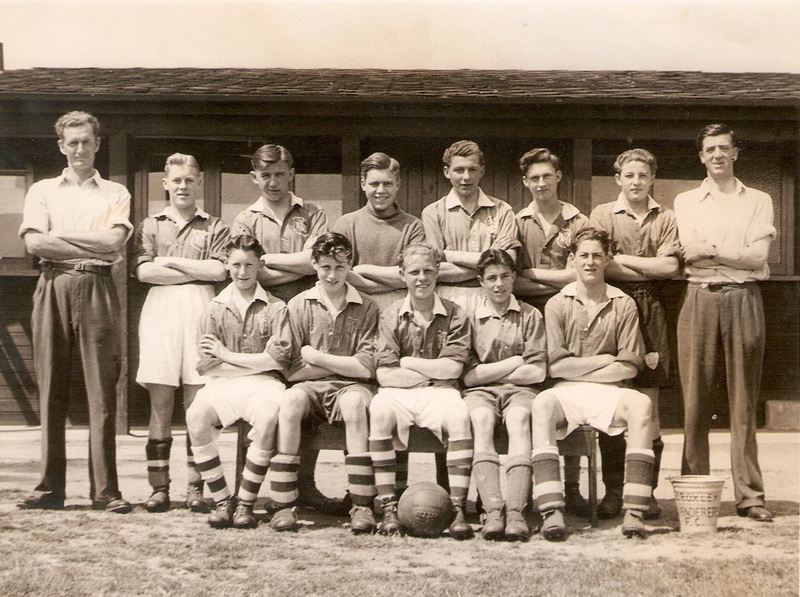 One notable boy Bedford Jezzard (1927-2005), spent his teenage years playing football as an amateur in Croxley Green and his skills were soon spotted by the local Watford team, for whom he made three FA Cup appearances. Jezzard spent most of his professional career as a striker at Fulham Football Club. 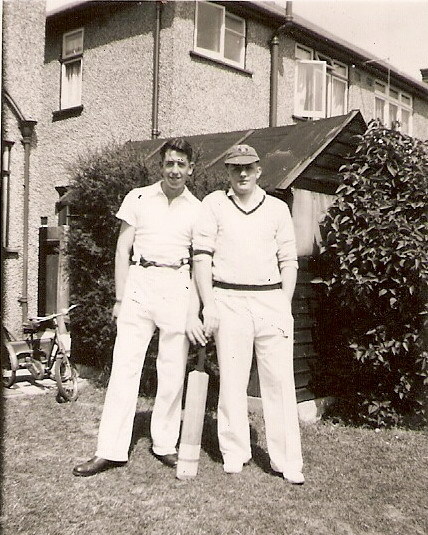 He also won two England caps in 1954 and 1955 but due to injury in 1957 his playing career came to an end. However,"Beddy" Jezzard later managed Fulham from 1958 until 1964, taking them back into the First Division.